On June 4th 1989, Beijing’s infamous student demonstration that took place in Tian’anmen Square was violently stopped by the Chinese authorities. 24 years later, its commemoration is still highly censored in China but bypassed by the Chinese people in a humorous way. The famous photo “a man in Tian’amnen” Jeff Widener, representing one man facing a column of tanks has become the symbol of this tragic episode in Chinese history. 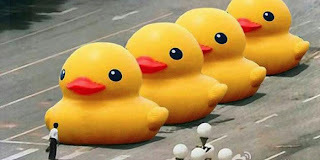 Last June 4th, a handful of rubber ducks positioned one after the other, representing the resistance to the censorship of the Chinese government has become so famous on Weibo, the Chinese Twitter, that it could also be found widely on social networks in the West. To replace the tank by ducks is a way to discuss this event and to make fun of censorship. Chinese Internet users compete to circumvent censorship government during the anniversary of the massacre in Tian’anmen Square, which is still an absolute taboo. They use humor among other: instead of saying June 4th, a keyword that is certain to be censored by the monitoring software from Chinese authorities, they speak of May 35th! The Chinese authorities are on high alert to prevent any commemoration, whether physical or virtual, on the Internet and social media. Ironically, that day is also called “Internet Maintenance Day”. On June 4th, the Chinese Web is largely out of service, and many officials are supposed to be “working” on the network. Web pages and sensitive internet searches are inaccessible, more than on a usual day. If a user tries to look Chinese “Tian’anmen”, it will not work, but might induce the webuser to be pursued by the Chinese authorities. Posts deemed to be “illegal” and published on the Web are quickly “harmonized” (censored) by the administration that thus purges any prohibited words, within a few minutes. Knowing their words being severely monitored, users also use the image to convey their protest messages, showing, for example, an avatar candle to show some sort of commemoration. The images of candles were of course suppressed by censorship, as well as the Olympic torch used as an emblem with a similar scope. To avoid censorship and connect to the sites of your choice, choose a VPN service that makes your Internet connection completely anonymous. You just have to select a VPN server in one of 12 available countries. You can access blocked websites and protect all your activities on the Internet with a secure VPN tunnel including a virtual military encryption. The VPN installation is simple and does not take more than 2 minutes, so do not hesitate anymore.